The Breviary says of St Clare: “Following the example of St. Francis, she distributed all her possessions among the poor. She fled from the noise of the world and betook herself to a country chapel, where St. Francis himself sheared off her hair and clothed her with a penitential garb (on March 18, 1212, at the age of eighteen). Then she resided at the Church of St. Damian, where the Lord provided for her a goodly number of companions. So she established a community of nuns and acted as their superior at the wish of St Francis. For forty-two years she directed the nunnery with zeal and prudence, her own life serving as a constant sermon for her sisters to emulate. Of Pope Innocent IV she requested the privilege that she and her community live in absolute poverty. She was a most perfect follower of St. Francis of Assisi. 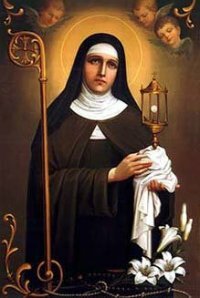 Heroic in suffering (she was sick for twenty-seven years), she was canonized only two years after her death. Thomas of Celano coined the saying: Clara nomine, vita clarior, clarissima moribus. In our twentieth century there still remain large areas with millions suffering under extreme poverty. Poverty in itself is no virtue; but it should be made into a virtue. Let us recall a few of the examples and texts from holy Scripture which show how precious poverty is and what deep reverence we should have toward it. Christ was poor. His entrance into the world and His departure from it took place in circumstances of greatest need. He had no house wherein to be born, no crib; no house wherein to die, no deathbed. Poverty stood watch at birth and remained to see His death. “The foxes have dens and the birds of the air have nests; but the Son of Man has nowhere to lay His head” (Matt. 3:20). Grant us, we beseech Thee O almighty God, to extinguish the flames of our evil dispositions, as Thou didst grant blessed Lawrence to overcome the fires of his torments. Through our Lord Jesus Christ, Thy Son, Who liveth and reigneth with Thee in the unity of the Holy Ghost, God, Forever and ever. R. Amen. Graciously hear us, O God our Savior, that as we rejoice in the festival of blessed Clare, Your Virgin, so may we be nourished by the food of her heavenly teaching that we may be enlightened by the fervor of her dedicated holiness. Through Jesus Christ, thy Son our Lord, Who liveth and reigneth with thee, in the unity of the Holy Ghost, ever one God, world without end. R. Amen. May the offering made by Your devoted people be pleasing to You, O Lord, in honor of Your Saints, through whose merits they know they have received help in times of trial. Through Jesus Christ, thy Son our Lord, Who liveth and reigneth with thee, in the unity of the Holy Ghost, ever one God, world without end. R. Amen. Filled with Thy sacred gift, we humbly beseech Thee, O Lord, that what we celebrate with our homage duly given by the intercession of Thy blessed martyr Lawrence, we may also know as an increase of Thy saving grace within us. Through the Lord Jesus Christ, Thy Son, Who liveth and reigneth with Thee in the unity of the Holy Ghost, one God For ever and ever. R. Amen. You have filled Your people, O Lord, with sacred gifts; we beseech You to ever comfort us by the intercession of her whose festival we are celebrating. Through Jesus Christ, thy Son our Lord, Who liveth and reigneth with thee, in the unity of the Holy Ghost, ever one God, world without end. R. Amen. Day III in the Octave of St LaurenceGodHoly GhostIntroitJesuJesus ChristLawrenceLordMartyr; Commemoration of St ClareO LordVirgin: Missa "Conféssio et pulchritúde"